I recently ordered a slew of comics from Ediciones Valientes, a Valencia-based Spanish publisher known best in the US for publishing the work of Martín López Lam. I’m not certain what the structure of Ediciones Valientes looks like – it’s possible that López Lam is also the publisher. Regardless, Ediciones Valientes puts out a wide swath of work, including a new 32-page minicomic from Portuguese cartoonist Hetamoé. Spookytongue is the sixth comic in the Anti Sol line from Ediciones Valientes, and was published in collaboration with Portuguese zine label Clube do Inferno. Spookytongue opens with a text-heavy dialogue page, like the opening of an 80s anime or a Star Wars film; Hetamoé explains that an uncommon inflammatory mucosal disease, geographic tongue, is a window by which past and future worlds can be seen, and that in 2525, artificial humanoids are being developed in order to wage quantum war. The trick is that this introduction explains little if nothing of the comic that follows. 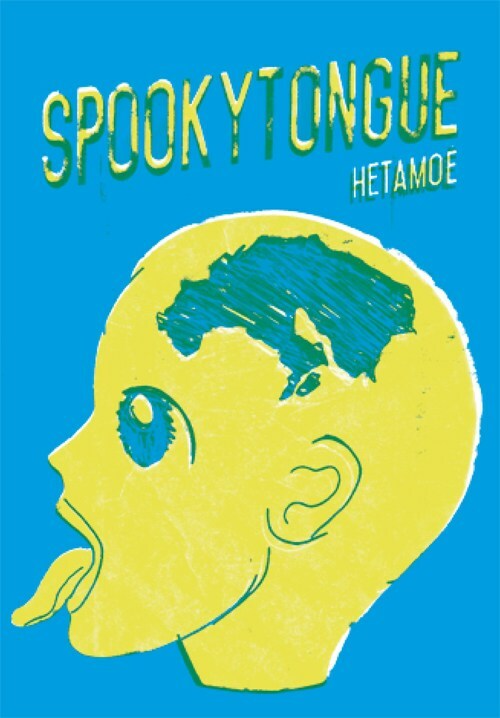 Spookytongue is split in two distinct halves – the first is a more traditionally western layout, and the second is influenced by the Japanese comic strip 4-koma style. Throughout, Hetamoé’s work takes on a futuristic sociopolitical bent, half cyberpunk and half philosophical musing. I’m reminded of the work of famous mangaka Masamune Shirow as much as I am the work of Finnish cartoonist Ville Kallio, although in both cases Hetamoé’s work is much more abstract about the future it envisions. These comparisons seem apt because like Kallio’s work, Hetamoé’s work is influenced by Japanese art, especially creators like Shirow. There are some thematic elements to the book that are hard to grok– the unicorn is a frequently appearing visual motif that I had a hard time placing. 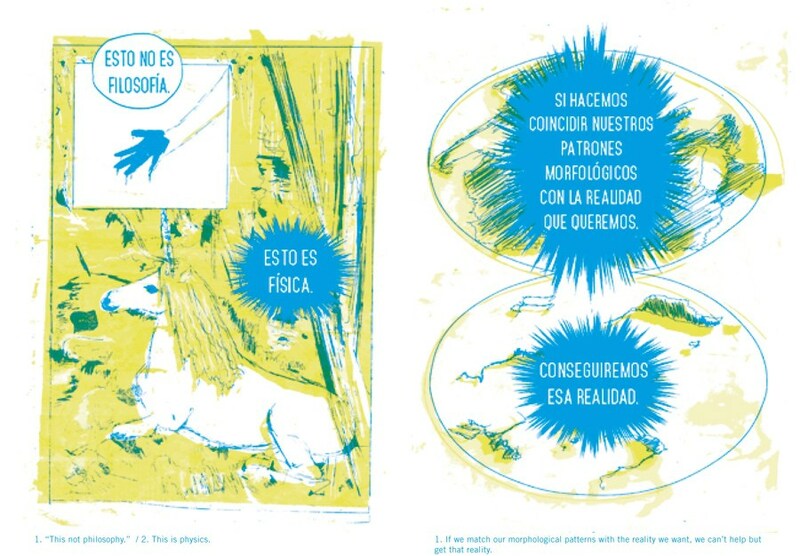 The book is printed in two colors, a vivid blue and a lime green/fluorescent yellow. The color choice exaggerates and emphasizes the retro-futuristic feel of the book. The language of Spookytongue is flowery and opaque; Hetamoé manages to capture the background noise of cyberpunk with seemingly unlinked ideas and observations of the world and our universe. If anything, Spookytongue, with its unique formal constraints, seems like a window into a future world passing you by. As the reader, you will catch snippets of a whole conversation without piecing together its meaning. Spookytongue is moving too fast, or more likely, you’re moving too slow. Sequential State is on Patreon – if you liked this review, please consider being a monthly patron. The goal is to make Sequential State a better hub for comics criticism, interviews, and more, but I can only do that with your help. Thanks!